Welcome to A Sampling Bee! Today, I share with you Aroma Getaway Subscription Box. This subscription box is full of travel themes items. Items such as candles, car fresheners, room sprays, tea light candles, etc. Each box contains goodies from different vacation spots. July's vacation theme is Hawaii! So, what's in July's Aroma Getaway Box?.. By The Bay Botanicals Gardenia Waimea White Gardenia Scented Palm Wax Candle 4oz. I love all of the goodies in this subscription box. With this months box, it allowed me to visit Hawaii right from the comfort of my own home. 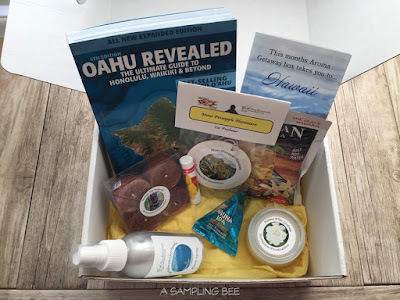 I have never been to Hawaii, so it was nice to experience the Hawaii themed products in Aroma Getaway's Subscription Box. Opening the box, I immediately smelled a lovely floral scent. Which of course was coming from the Gardenia Candle and Tea Lights. Both of which I really love. The Lip Balm is really nice. It makes my lips soft. I have yet to try the Iced Tea and Macadamia Nuts. The Room Spray went right into my bathroom because it smelled amazing. The Car Freshener of course makes my car smell good. All-in-all, great products in Aroma Getaway's Hawaii Box. I highly recommend this subscription box. Take a trip to a different vacation destination and subscribe today! I received Aroma Getaway in exchange for my honest review. All opinions are my own. Always!